We interrupt the posts on my holiday up North to introduce a new member of our household! If you have seen this post, and this one, you would know that Moomin holds a special place in my heart. My best friend K (who can read my thoughts, make me smile, know exactly what bag I will like, and other such best-friend-ish talents) brought him back for me from a recent trip to Hong Kong (the biscuits in the background are Moomin biscuits also from K…double hooray!). 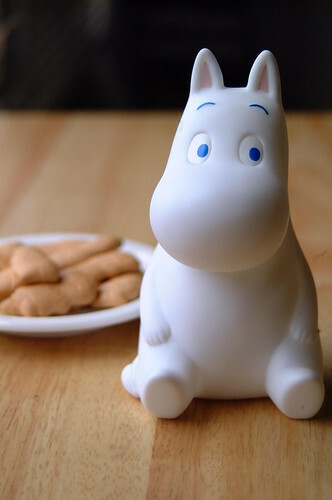 I know…Moomin comes from Finland, not Hong Kong, but I’ll have you know that he holidays in Asia quite often. If you have your own unexplainable love for cute, inanimate objects such as cartoon characters and children’s toys then you know, and perhaps share, my joy. If you don’t, no fear, this will be short and the regular agenda back shortly. Yay! This is just so adorable even with the lights off.